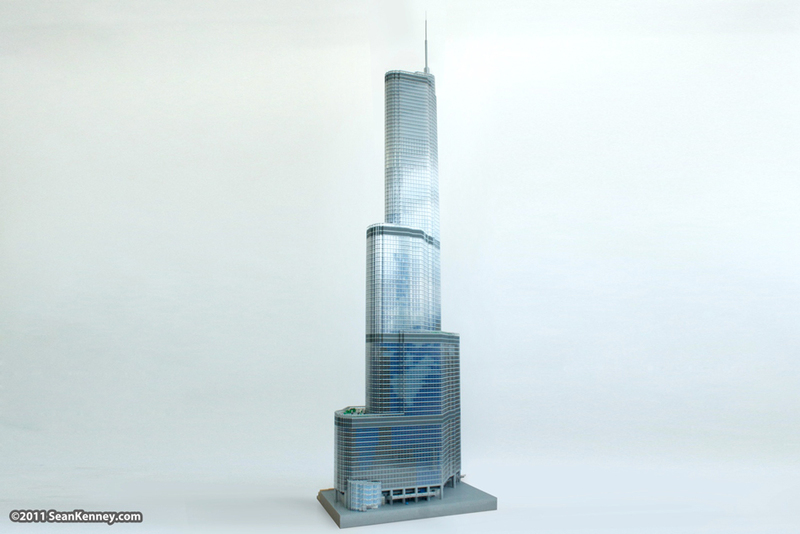 This model of Chicago's second-tallest skyscraper is 10 feet tall and contains 65,000 LEGO pieces. That's right... It's 10 feet tall! The building was created together with the Tribune Building and Water Tower Place which are together on permanent display at the LEGO store at Water Tower Place Mall in downtown Chicago. The real building is covered in reflective glass, which makes it melt into the skyline when you look at it. I knew that I wouldn't be able to create a reflective LEGO model, so I spent a lot of time prototyping and designing different ways of building the facade. I realized, when trying to design the building, that reflective glass fools your eye into thinking you are looking at something farther away. That, coupled with the fact that this building mostly reflects the sky, makes the real building melt away into the skyline without looking imposing. To replicate this with LEGO bricks, I created the walls of the building several pieces thick... The outermost layer is clear LEGO pieces, behind them are various shades of translucent blue, white, and smokey colored pieces, and behind that are opaque sky-blue LEGO pieces. Looking at the model, your eye is fooled by the depth of the facade, and you catch glimpses of reflection together with varied colors from the depth of the walls, duplicating the effect that you get looking at a building of mirrored glass. The entire model took over a month of full-time work, together with my assistants Jung Ah, Eun Nye, and our very special guest star David Pagano.